Five years into the age of the customer, investments in mobile, cloud, big data, predictive analytics, and social technologies are booming. But unlike previous technology cycles, tech investments will continue to grow rather than diminish throughout the refinement period. 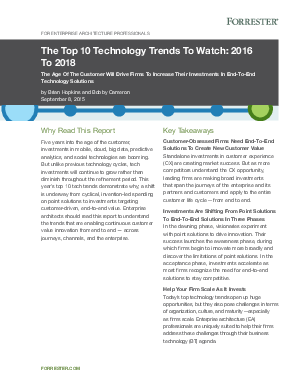 This year’s top 10 tech trends demonstrate why; a shift is underway from cyclical, invention-led spending on point solutions to investments targeting customer-driven, end-to-end value. Enterprise architects should read this report to understand the trends that are enabling continuous customer value innovation from end to end — across journeys, channels, and the enterprise.